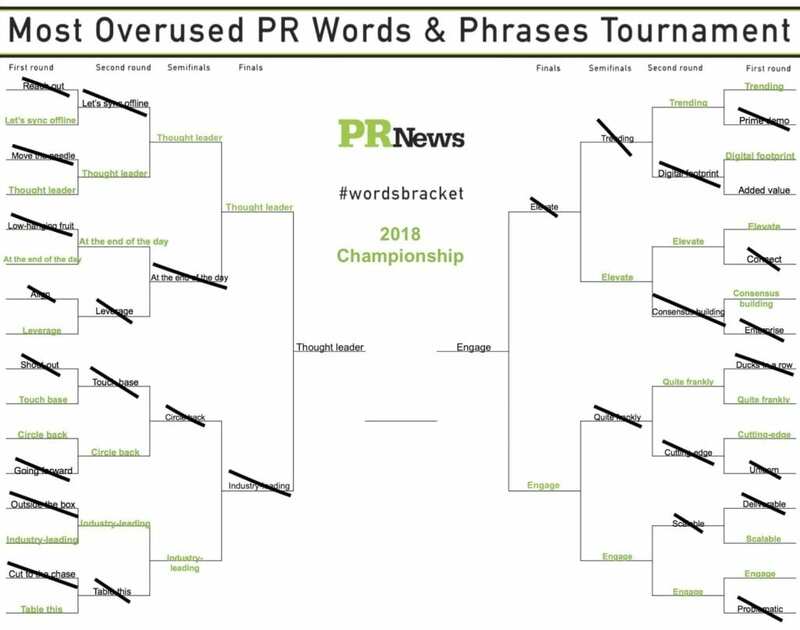 We're down to just two contenders in PR News' 2018 Most Overused PR Words & Phrases Tournament: "thought leader" and "engage." PR News' community on Twitter has been voting for the past several weeks through four rounds of brackets. This time around "thought leader" bested "industry-leading," and "engage" edged out "elevate." The shockers of this year's tournament so far are the relatively early exits of "at the end of the day" and "quite frankly." Just as in the 2016 presidential election, the pundits have shown themselves to have feet of clay. You now have an opportunity to vote for either "thought leader" or "engage" for the 2018 championship. Download a printable .PDF of the #WordsBracket and vote on Twitter for the overused word or phrase that you think should be stricken from the business lexicon. We'll announce the winner on April 9.